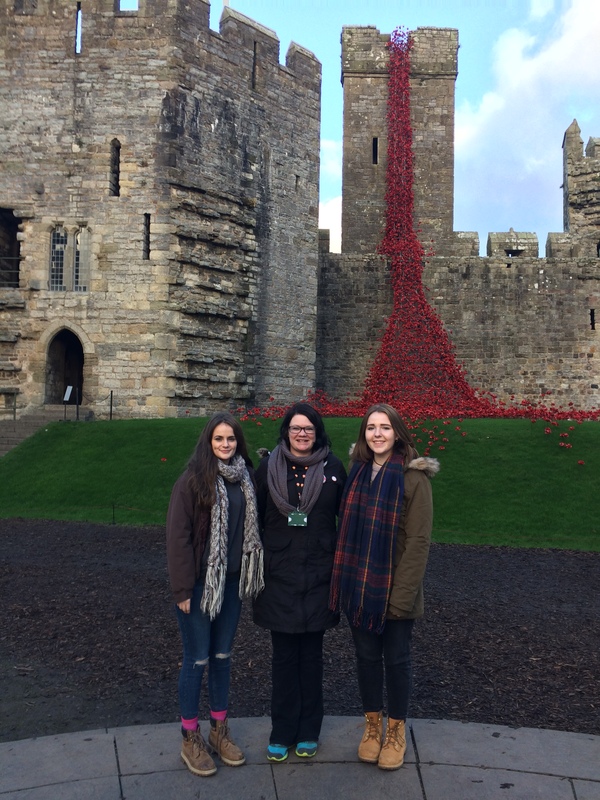 A week of volunteering as a Poppy Ambassadors at Caernarfon Castle was a brilliant choice for us as it appeared to offer a range of opportunities, not only in allowing us to gain experience that will aid us in the world of work, but also facilitated us in completing a part of our gold Duke of Edinburgh award. Conversing with such a diverse group of volunteers has provided us with a real insight into what the installation evokes within each individual; whether it acts as an artistic muse or as a commemorative exhibition (especially poignant with regards to the centenary of the First World War). We first read about the poppies’ move to Caernarfon in our local newspaper and this sounded like something both of us would be motivated to get involved with, especially as we are both currently studying A-Level history and are considering taking this to degree level. We believe that it is important for people of all ages to be involved with history and to remember and reflect upon our past, as well as learn from it – particularly in lieu of recent world events such as the American presidential election and the Syrian refugee crisis. A highlight of our volunteering has most definitely been a guided tour of the exhibition with a group of blind veterans as The Last Post was played. “We were the only four who knew how to swim. I had one hand with the rope attached to the boat as I moved my two legs and one arm. It was three and half hours in cold water.” This is 18-year old Syrian refugee Yusra Mardini explaining how her Olympic sport of swimming, saved her life whilst crossing the freezing Aegean Sea as she pushed a sinking dinghy to sanctuary saving 20 other lives. Among the 200+ countries and territories competing in the Olympic Games in Rio, Mardini’s team stands out: Refugee Olympic Team (or ROT). The International Olympic Committee announced in March the creation of this team, the first of this kind, made up of 10 members who fled from 4 different countries: South Sudan, Ethiopia, Syria and the Democratic Republic of Congo. The IOC’s open minded decision to include these athletes in these games comes at a period when refugees have been breaking records and not Olympic ones. Today, according to the UNHCR 63.5 million people have been displaced by conflict and persecution with 15 million refugees worldwide. 60% of these refugees come from 5 specific countries: Syria, Afghanistan, Somalia, Sudan and South Sudan. Each member’s road to Rio has been an uphill battle from the start, having to flee persecution whilst at the same time completing the gruelling training needed to secure a spot at the Olympic Games. Yet in the face of rising anti-immigration and xenophobic feelings in many developed countries can this team really change attitudes towards refugees and asylum seekers? Anti-immigration and racist sentiments have been growing in parts of Europe and the United States. Last year a renovated shelter destined for asylum seekers in the town of Vorra in Germany was subject to an arson attack, and many eastern European countries have used tear gas to prevent groups of refugees from crossing their borders. Time and time again we have heard the growing concerns over the mass of asylum seekers “flooding” the UK. In reality, refugees represent 0.19% of the UK’s population, whilst in Lebanon, a country 23 times smaller, 1 in 5 people are refugees. But despite these relatively low numbers, some British citizens still feel threatened by a mass influx of refugees, with the National Police Chiefs’ Council reporting significant increases in hate crimes nationwide since the Brexit vote. On the other side of the pond, Donald Trump’s angry rhetoric on Muslim communities and immigrants is also spreading like wildfire. This toxic mix of anger, hate and xenophobia has seemed to dominate recent headlines. But the Refugee Olympic team are hoping to challenge people’s views and opinions on the millions of refugees worldwide at this year’s Olympics. This message has been embraced by all the team’s members; Popole Misenga, a ROT member from Congo (Judo) said that the team were “fighting for all the refugees in the world”. Mardini, when asked if her experience of pushing the dinghy was traumatic responded with her trademark positivity: “Not at all. I remember that, without swimming, I would never be alive maybe because of the story of this boat. It’s a positive memory for me.” Very few Olympians can claim that their sport has saved their life. She’s also stood up in defense of the refugees across the world saying that she “want[s] [Olympic fans] to think that refugees are normal humans that had to leave their homelands. Not because they wanted to, not because they wanted to be refugees or run away or have drama in their lives. They had to leave. To get a new life. Get a better life”. The Refugee Olympic Team are not only the flag bearers for millions of refugees across the world but are also carrying a message of hope and tolerance at a time when it is so desperately needed. 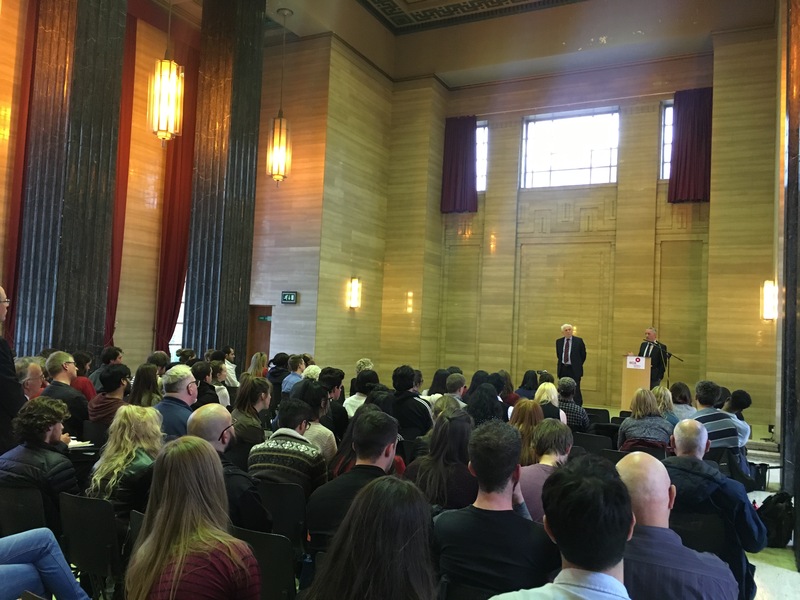 This blog reflects on attendance at a recent event organised by ESRC, Cardiff University and the EU Hub to provided informed answers to questions about the upcoming EU Referendum. The speakers included economists, lawyers, and political scientists, including the head of the UK in a Changing Europe initiative Professor Anand Menon, economist Professor Angus Armstrong, regional policy expert Professor Fiona Wishlade and commercial law specialist Emyr Lewis and Cardiff School of Law and Politics’ Dr Jo Hunt. I have been disappointed in the so-called debate about the EU referendum so far. What I have seen amounts to little more than glorified name-calling and fear-mongering. Is it possible to hear something of substance about the choice we are being asked to make? This event set out to provide ‘informed’ answers to questions that the audience posed. The panel of invited experts were largely academics with specialist interest in areas relevant to the upcoming referendum. The driving force behind the session was UK in a Changing Europe who with Full Fact produce an informative booklet Leave/Remain: the facts behind the claims. Chaired by Owain Phillips, a political reporter from ITV Cymru Wales, the questions covered different aspects of the EU. Particular things that struck me from the discussion included the way in which the principle behind the ‘single market’ is not something we currently have access to – it is something we participate in. There is a distinction which is important. When it comes to legislation, the approach taken by the EU is to ensure that we treat members of the EC no differently to the way we treat our own nationals when they are in the UK. On this point the question of benefits that immigrants claim is seen to be a product of our non-contributory system. We treat visitors the way in which we treat ourselves by sharing the non-contributory system. It is in essence a result of the UK legislation more than EU legislation. This aspect is clearly now coming under review by all EU governments as benefit systems are subject to stresses that were never anticipated when first set up. It was pointed out to that there are different ways such support is termed and used within EU member countries which does not help the comparisons that are made. Wales we learnt is a net beneficiary from EU finance. Questions surrounding devolution have not been well considered and present significant issues should we elect to leave the EU. What border controls will be put in place in Ireland between the north and south? If Scotland goes for independence would we see border controls put in place on the UK mainland? What happens to devolved powers if we leave and EU inspired legislation is revisited and Wales takes a different view to the UK government. Remember devolution happened after we joined the EU. Much UK legislation is mixed in terms of EU inspiration and UK sourced and will present much room for debate and discussion in the future should we leave the EU. Sovereignty was described as a rather ‘plastic’ issue by one speaker. Another suggested that we might reasonably focus on issues of power and influence. Especially whether we are best served in that regard from being in or out of the EU. In all it seemed clear that the ‘experts’ usual answer to ‘what happens if we come out of the EU to …. ?’ was ‘We do not really know’. It certainly seemed clear that the people who will benefit most from leaving the EU will be lawyers of various types. I went in to the meeting believing that we should remain in the EU. I heard no compelling argument to change that viewpoint. I did hear a number of questions asked that suggested if we stay in there are many reasons to keep questioning and challenging the ideas that politicians keep throwing around. One panellist said that in his experience students in the UK had a very low level of knowledge about the EU and how it worked – I would have to put myself in that same camp. The nature of the ‘arguments’ in the public sphere that I have heard from politicians from all camps suggest that many of them should attend question and answer sessions like this one. Reference was made to Norway who have to endure the ‘EU regulation’ and its costs but with no influence within the the EU. Yet apparently some 75% or so vote not to join the EU. Maybe we should all ignore the facts and go with a gut feeling! The views expressed in this blog are the author’s own and do not reflect the views of the WCIA. 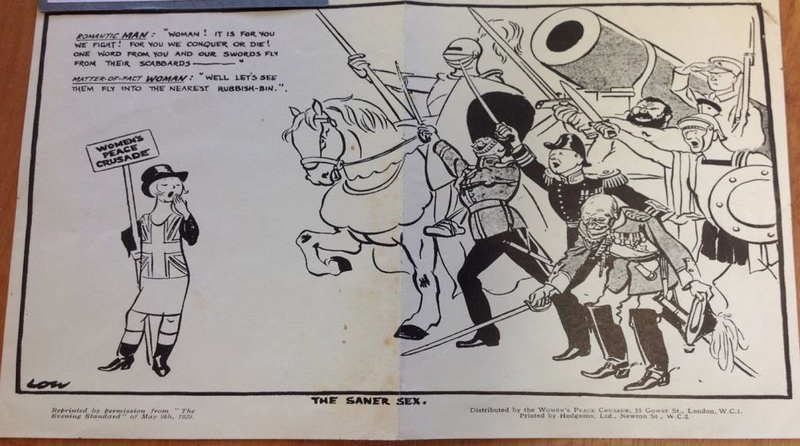 Following the horrors and destruction of the First World War (1914-1918) many women around the globe became activists in the campaign for arms reduction and for the end of war as a means of settling international disputes. Across Britain a variety of women’s groups came together to organise a peace pilgrimage to London for a mass demonstration in Hyde Park on 19 June 1926. 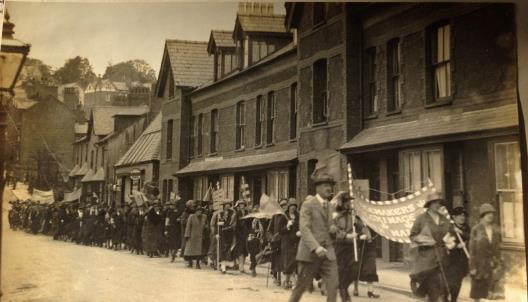 In north Wales, under the leadership of two tireless peace activists, Mrs Gladys Thoday and Mrs Silyn Roberts, a procession of peacemakers travelled for five days through the towns and villages of north Wales to reach Chester. Eventually 28 north Wales’ pilgrims joined the 10,000 women at the Hyde Park demonstration. World War 1 unleashed unimaginable levels of death and destruction across the whole planet. Millions of people, both military and civilian, were killed or suffered serious injury – estimates for casualties run from 30 million upwards, but the true number will never be known. From Britain alone over 723,000 service personnel were killed in the conflict and over a million more were seriously injured. The war had destroyed the lives of so many young men on the battlefield that by 1921, there were one million more women in Britain than men, aged between 20 and 39. It meant that many women were unable to find partners in life or have children and raise a family. The impact of the war on Britain was devastating both socially and economically. As early as 1915 there were organisations of women around the world calling for mediation between governments to end the war. By 1919 the Women’s International League for Peace and Freedom (WILPF) had become a permanent committee with a headquarters in Geneva, Switzerland. The League called for international disarmament and an end to economic imperialism, supporting the US /France Kellogg-Briand Pact of 1928, as the basis for creating a peaceful world order. The women of Britain were very much involved in these quests for peace, freedom and equality. (Remember, in Britain, it was only in 1918 that all males over the age of 21 finally won the right to vote. And it wasn’t until 1928, and the Equal Franchise Act, that the same rights were applied to women over 21 for the very first time). In light of this struggle to have their voice heard, under the slogan ‘Law not War’, a variety of women’s groups from across Britain came together in 1926 – as wives, widows, mothers, sisters and friends – to organise a huge peace pilgrimage to London. Without modern ‘social media’ to help, it was a great enterprise to spread the news of the pilgrimage to all the remote villages and hamlets of north Wales in the 1920s. They would rely largely on newspapers and post to carry their message. But it all needed effective organisation and for this the north Wales pilgrimage can be thankful for Mrs Mary Gladys Thoday from Llanfairfechan. Among the 28 north Wales pilgrims who finally took part in the peace demonstration in Hyde Park on 19 June 1926 were Mrs Thoday and Mrs Silyn Roberts. These two women addressed the crowd of 10,000 that day in central London – Mrs Roberts spoke in the Welsh language. Following the peace pilgrimage these two women later became the English speaking and Welsh speaking secretaries of the North Wales Women’s Peace Council (NWWPC). In 1928, under the professional guidance of Mrs Thoday and Mrs Roberts, the voice of women in north Wales was linked to other parts of Britain and the wider international peace movement when the NWWPC became affiliated to the Women’s International League for Peace and Freedom. Although the North Wales Women’s Peace March had ended, a Welsh women’s voice had been added to the international call for disarmament and world peace. Their actions played a part in the eventual signing by 62 nations of the Kellogg-Briand Pact, an agreement in 1928 which hoped to outlaw war between nations and prevent another World War. Written after Georgia attended the WCIA event ‘ISIL, Syria and the Middle East, The US Perspective’ with a talk from Thomas Williams from the US Embassy in London. The Middle East is one of the most controversial topics talked about today. December 2010 saw peaceful Arab Spring protests about socio-economic issues and against Arab dictatorships. In March 2011, the Syrian government used violence in retaliation against the demonstrators. Once a minority of these protesters fought back, along with some of Syria’s troops, a civil war began in Syria, which rippled across the Middle East. It led to international intervention, including by the USA. On 28 April 2016, Tom Williams from the US Embassy in London spoke in Cardiff at the WCIA about the US perspective on issues in the Middle East. He stated that the US strategy in regards to the Middle East is straightforward: the achievement of real stability links to a “consistent international rule of law.” There is a right to act unilaterally, but the US do not perceive this as a sufficient method of intervention compared to diplomacy. Williams stressed the importance of historical relationships, e.g. with the UK, but also with new allies. In my opinion, this is a sound plan, but also an inconsistent one, as Obama originally wanted to take military action and then changed his mind. This may give people in the Middle East a false hope that at some point the US may intervene militarily, which I think will only drag out the war in Syria. Williams described the Middle East as a “region of regimes” which were disrupted by the Arab springs; they are still dealing with the consequences of political transition as a result of the protests. There are many issues facing this part of the world. Demographically there is a youth bulge and a surge of underemployment in some areas. The antiquated schooling systems result in high levels of illiteracy which increases the unemployment rates. The rule of law is particularly sketchy, with the demonstrations in 2010 and 2011 fuelled by the resentment of corruption. Additionally, political instability is one of the main issues of the Middle East, with the crisis from the civil war in Syria flowing to the surrounding countries, leading to a surge of refugees which has broad international impacts. Williams said the top priority of the US foreign is Syria, with the crisis continuing into its 6th year, 5 million refugees are currently registered. Some are staying in camps but a large number are currently in host communities which is demanding not only on the governments of these countries, but also on the general population due to competition for housing and labour. The biggest strain is on Jordan, Turkey and the Lebanon. But all of this was inevitable- with any major political transition comes upheaval of society. So in my view the US should have anticipated and planned for before they intervened. Williams said that the strategy undertaken by the US is threefold. To mobilise the partners for the campaign to fight ISIL. Diplomacy to end the civil war in Syria. Talks are vital, with Williams describing current talks as the most promising initiative in years. There are sharp divisions, but there is unity to have political transition. A humanitarian approach which aims to ensure that the instability does not spread beyond the borders of Syria. In particular this looks at hosting refugees. In my opinion the first strategy creates more work for the third strategy. Fighting against ISIL will increase the need for humanitarian aid. The safety of the people in Syria is more likely to be jeopardised if there is more conflict. Therefore putting more US effort into diplomacy will be more effective; if the country is more stable because of peace negotiations then the need for humanitarian aid will decrease. A member of the audience questioned the changing stance of the USA. At the beginning of the civil war the US, UK and others made it clear that Assad must go. However, after the emergence of large terrorist organisations such as ISIL, the attitude towards Assad became much more positive. Is it not defeating the point of original intervention if the Assad regime stays? The evolution of views, Williams said, reflects the change in circumstances. He explained that after the protests in Syria, Assad lost legitimacy; ultimately the situation with Assad will have to be negotiated with the Syrian government because America’s underpinning policy is unchanged. The US have also been focusing on political and economic issues, with the International Monetary Fund and the World Bank working together to build the economy. A member of the audience questioned how helpful economic institutions like the IMF really are in this region. The speaker answered arguing that humanitarian efforts are not always effective in particularly violent areas. Experience in Iraq and Afghanistan have highlighted the difficulties in humanitarian progress as it is hard to give evidence that the US has actually helped. So a potentially more effective alternative is stabilisation of the economy. I think this point is well thought out as the stabilisation of the economy will in turn aid society if there is something to support the people. But a reliance on westernised systems may cause the Middle East to become too dependent on the west. The US should help to stabilise the economy, but without constant economic support so that these countries can survive by themselves economically. Williams expressed that the main goal within the surrounding countries of the region is to secure political stability. The USA are supporting a Tunisian democratic transition through a mutually agreed agenda, working with Tunisia to fight corruption. He argues that US intervention has helped a stronger, improved government through decentralisation, with Obama describing the country as a potential counter terrorism partner. The USA have also been working in Libya to assist public institutions to become political institutions; the government of national court has made progress, but has yet to establish legitimacy. There has also been growing terrorist presence in Libya, which could threaten these improvements. Additionally, the USA have looked at negotiating with Israel and Palestine where there is currently little political motivation. Williams stressed that they must stay committed to these countries. He emphasised diplomacy, using the example of its success in Iran. He suggests Iran could have chosen to create nuclear weapons but made the choice to refrain from gaining such resources because of negotiations with the US. Although the speaker still described Iran as a concern, it does go to show that patient collaboration works. A member of the audience asked if ISIS was dealt with tomorrow, did Williams not think that the US had established alliances for the sake of it. However, the speaker highlighted that some of their allies, such as the Kurdish forces, are highly problematic in the region, but they focus on working with effective forces to fight terrorism; the regions themselves are to deal with the aftermath. They fight the shortest term challenge and then deal with other issues as they emerge. A survey by ORB international found that 22 per cent of Syrians believe that ISIS has had a positive influence on their country. In my opinion, this weakens US intervention, and suggests that there is a decreased confidence in America’s aid. All this lengthens the time it will take to progress towards political stability. Williams concluded that military intervention is not always the best option. Real diplomacy, although hard and sometimes unsatisfactory, is fundamental. The USA needs the world in order to succeed in international intervention, but the USA is also central to the world for diplomatic intervention. International community is important. A diplomatic approach to the Middle East, rather than military intervention is a long process, but I think the most successful option likely to achieve political stability and peace over military intervention. Due to the threat that ISIL pose on the world, military action can make the situation worse. To establish peace negotiations by Middle Eastern countries would lead to future conflicts being resolved within these regions without the need for external intervention. The USA could have handled the beginning of their intervention more successfully, with a consistent idea of how they would intervene in the Middle East. There is a history of military intervention in this region, for example in Afghanistan. So when the USA originally decided to intervene militarily but then changed their position to an emphasis on diplomacy, it gives the people false hope that eventually the USA will use military action to fight terrorist groups. Additionally, negotiations with Assad reinforces the idea of inconsistent policies of the US. This makes it hard for the Middle East to treat US intervention as legitimate if there is never a clear stance. So if the idea of diplomacy and humanitarianism is showcased consistently, it has the potential to prevent the elongation of the civil war in Syria.